Technology has really grown and we are living in a world where we want to get instant information. Having an app that can provide you with all the information you need on changing and expected weather patterns is a good thing. Below are some of the top apps that you can use. This has actually been ranked as the most accurate app available. It I powered by weather enthusiasts that give live data reports on hyper-local weather forecasts together with interactive satellite and radar maps and severe weather alerts. This is another brilliant app that has been recognized for its accuracy. It has the ability to give hyper-localized forecasts coupled with address and street and also minute by minute forecasts of the weather. The best thing about this app is the fact that it is very classic and thus very simple to use. Its advantage lies on the fact that it provides information on weather and also entertainment. 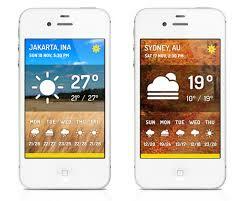 It comes with very many features and is able to provide quiet a huge variety of weather information. Another great app that is not only easy to use but is also very beautiful; it comes with a large number of amazing features like morning sunrise greetings, daily notifications and constantly changing backgrounds. This is an app that was created by MSN Corporation with an aim to ensure that all Windows users have all the latest weather information that they need. It provides the most recent weather forecast for the next 10 days, 5 days and hour; this allows you to easily plan your activities for the coming days. Apart from being able to keep you updated on all the latest weather information and also give you forecasts, this app also comes with a live background, an animated sunset and sunrise feature and a great setup, graphics and design. The one thing that sets this particular app apart from all the others is the fact that it provides you with data direct from the National Oceanic and Atmospheric Administration. This means that you have the advantage of getting the most accurate information on the severity of various weather conditions. This happens to be one of the weather apps that is most featured due to its great interface and design. It provides not only weather forecasts but also severe weather warnings. It comes with a traffic camera section that lets users upload and share images form where they are. It goes without saying that this app is dominating quite a number of smartphones in the market today. It provides weather updates time-to-time and it works best for people looking for information on the basic weather variables like the temperature. The best thing about this app is that it is self-explanatory and provides data and forecast of wind pressure and precipitation on an hourly basis. It also works very well to transform your location area on your phone to get you a radar view. All these apps work very well to provide good information and the app that you go with will basically depend on the type of information that you want and the phone that you are using. You can also have more than one app if you want to.